I recently returned from a trip abroad to Turkey, and I must say, my heart is still beating fast for all the inspiration I encountered. Today I am diving in to pattern. The Turkish are known for the intricate design details and layer upon layer of pattern. Primarily consisting of bold colors, it is not hard to miss a distinctively Turkish design. The Topkapi Palace is a must see when visiting Istanbul. After Constantinople was conquered by the Ottomans in 1453, Sultan Mehmed II constructed the palace on the original Byzantine Acropolis with stunning views of the Sea of Marmara. For centuries the palace housed the Sultans, their administration, concubines, and children. Covering 173 acres, the palace in layered in opulence and layers of pattern. The tiles represented are Iznik tiles, created in the town of Iznik (in West Anatolia) in the last quarter of the 15th century. 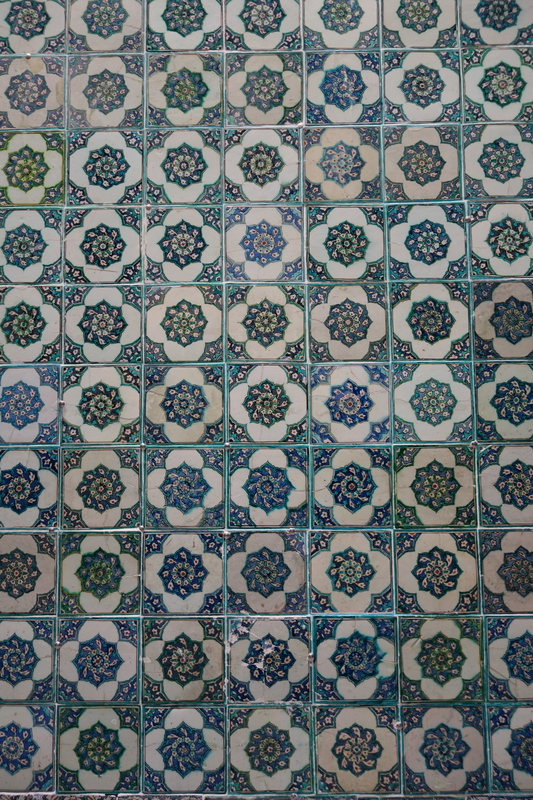 The tiles are primarily blue, with a combination of Ottoman arabesques and Chinese influence (the Ottomans were admirers of Chinese blue and white porcelain). The tulip symbol is also a repeated image in the tiles. The flower was originally found growing wild in Central Asia and was cultivated by the Turks around 1000AD. It later made its way to Europe and the Netherlands in the 17th century. 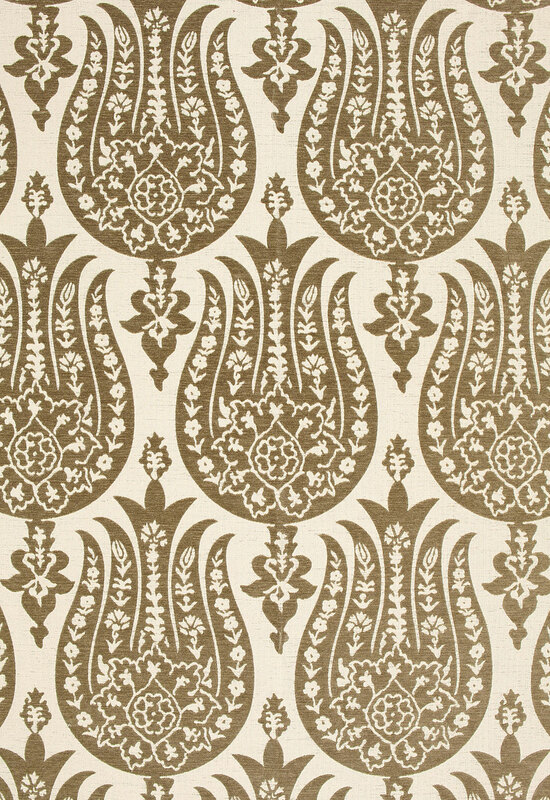 The detailing of Topkapi palace is renowned worldwide and has made appearances in fabric trends today. 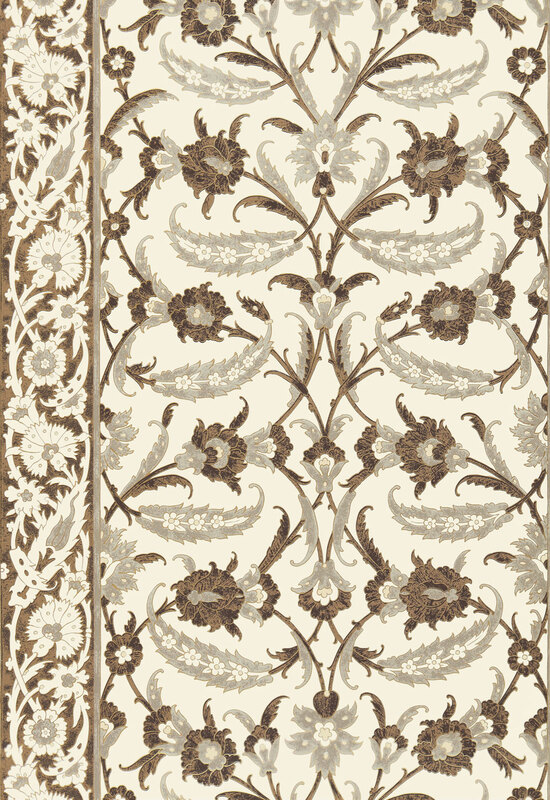 I’m loving this pattern from Schumacher. Take note of the tulip design. Appropriately named, Shumacher’s Topkapi comes in several color ways. So we covered the walls and fabric with pattern, but let’s not forget about floors. Many of the palace floors were covered in pattern as well. This terra-cotta hexagon is my favorite. And today, the floor sample shown at the right is a reinterpretation of the medallion grid pattern. Care to take a little Turkey home? Tabarkastudio has an overwhelmingly large number of beautiful Turkish tiles to bring a little pizzaz to your space. I will close today with some of their beautiful tile designs. Stay tuned for more next time when we talk Turkish rugs and I show you a few that I brought back for my stash!! Have a great weekend my Friends! Hello! Welcome to my little corner of the world. 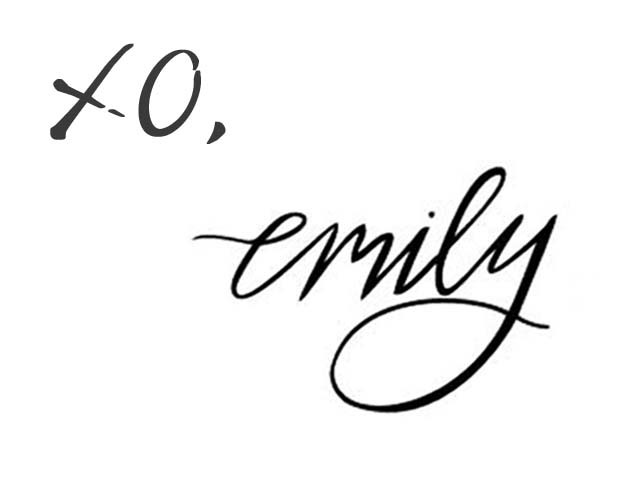 I'm Emily and am delighted to share with you my design musings. I believe in living honestly, loving well, working hard for your dreams, and that a beautiful and well thought-out space can have an impact on the human experience for the better. I am passionate about my sweet family, my God, and great furniture!! Come be inspired with me.